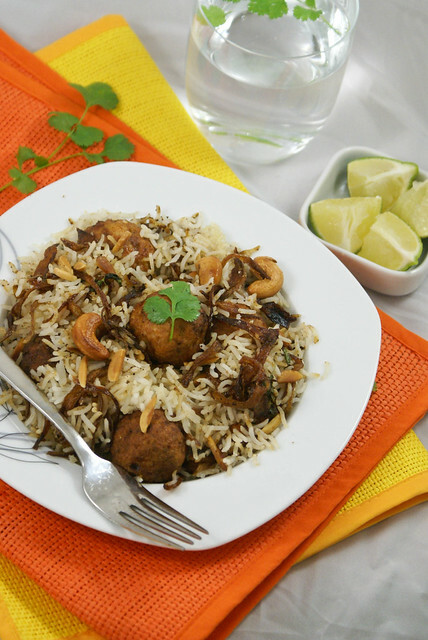 This Biryani has meatballs in savory, spiced, flavored Rice. It has a very subtle taste compared to the normal biryanis. This is one of the best one-pot meal, which is very comforting. First for the Koftas, heat oil in a deep frying pan. Once oil is hot enough, fry the meat balls in batches till they turn golden brown. Fry on medium heat, so that it gets thoroughly cooked even inside. In the same oil, fry the onions. Add in all the ingredients from Onion to Salt. Turn off heat and seive this water to remove all the spices. Add this water again into the same big vessel again. Take a big shallow baking dish. Drain the cooked rice, and start layering. Place half of the cooked rice at the bottom of the baking dish. Pour in 2 Tbsp Ghee evenly on the rice. On this sprinkle the ground masala powder generously. Now layer half of the fried onions. On this add half of the mint and corriander. 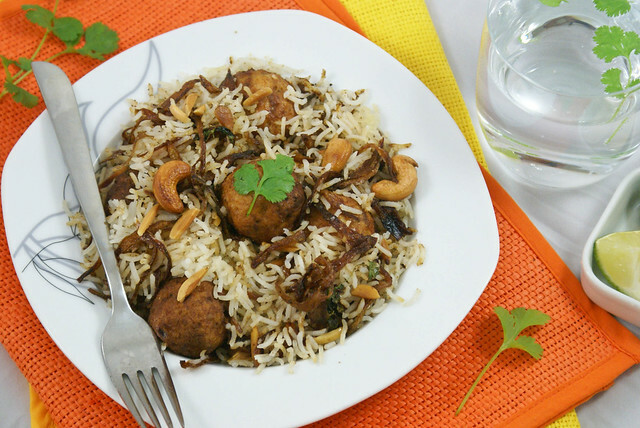 Add half of the fried cashew and almonds. Carefully Place the meat balls on the rice. Layer with remaining half of the rice. Again repeat the steps from adding ghee to adding nuts. Once done, remove the alu foil, gently fluff with a fork. Serve hot with Raita or Sherva. 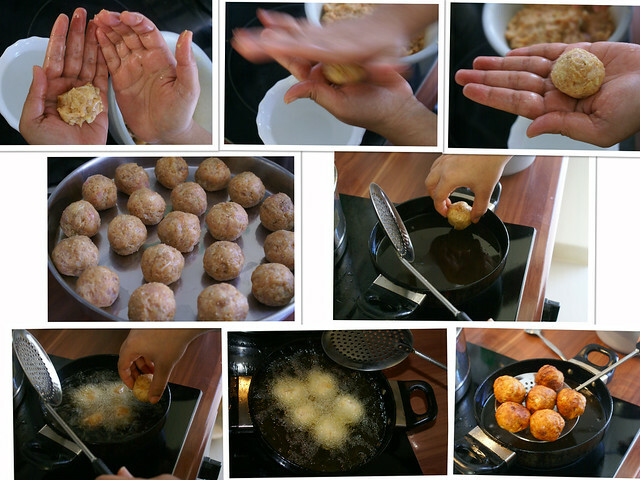 For the Kofta’s instead of deep frying, you can shallow fry them or bake them, for healthier option. For the Rice, instead of boiling water and sieving it, if you think its a long process, omit onion, ginger and garlic , and tie remaining spices in a small muslin cloth. 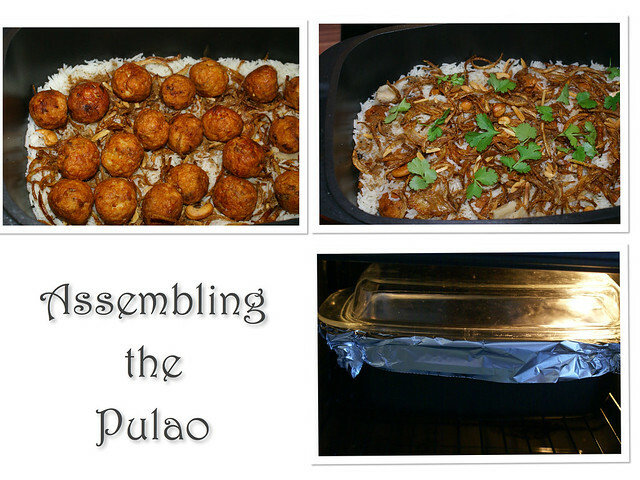 Now add the rice and spice pouch to water together. Once the rice is done, discard the pouch. For more flavor and that something extra, soak a few strands of saffron in milk and add this when layering the biryani. I dint have it at hand so omitted it. 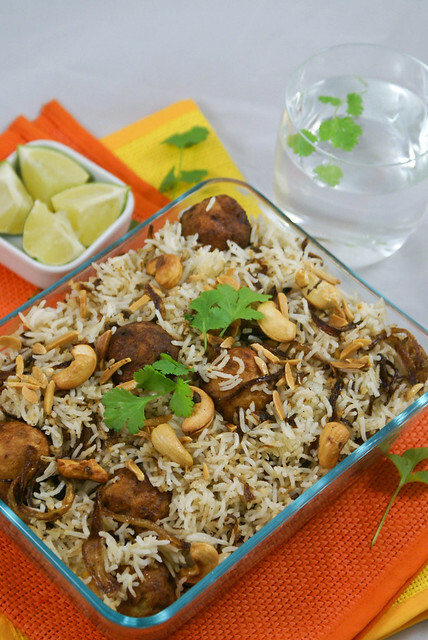 Mouth watering..Heavenly Biryani……..perfect clicks to tempt the readers……. How i wish i made it as fast as you, when i saw this in soma’s place i remeber telling her i am sure gonna do it, but till now i have not done it as Shyama is in college and I like muchmoe to make these things when she is here too. You have doen real justice to Soma’s dish, looks super yumm. I will be waiting for your version! 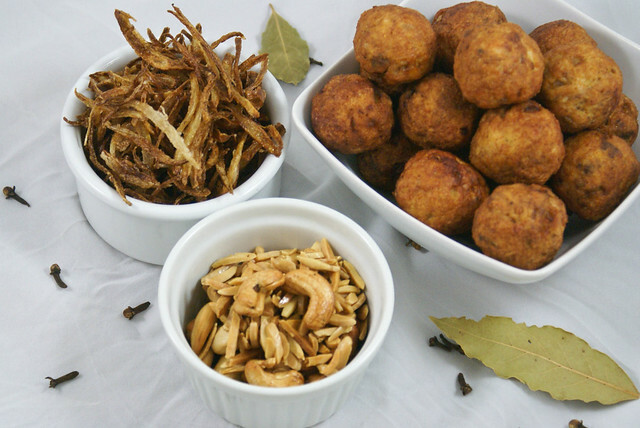 Those balls looks so tempting..would like to make mu veggie version with the same spice mix! Thank you so much for trying this out. The deep fried version must taste way better i am sure and yours looks so much better with those golden cashews! Mouth watering. Want to taste it right now!